Welcome to Ing’s Peace Project. Joanne Leone, one of our good friends came to visit us and she returned two of my Shadow of Peace posters that she took to the Far Brook School and ST. Phillips in Newark, her grandson, Ben’s 2nd grade and two 4th grade classes also, the adults to write their comments about “What does Peace mean to you?” I was very appreciative and happy to see all the nice and interesting drawings and the comments from the children and some adults. I started to work on the project for posting the comments and the artwork on my website. I worked up to 4:30 AM then I decided to go to bed. In my sleep I had a wonderful dream which I would like to share with everyone. The following is my dream. I had a dream last night. I saw students in a classroom talking and writing down their comments on “What does “Peace” mean to you?” I walked to the next classroom which was a kindergarten. The little children raised their hands when the teacher asked “What does “Peace” mean to you?” I just passed the first grade class where the teacher was discussing Peace. 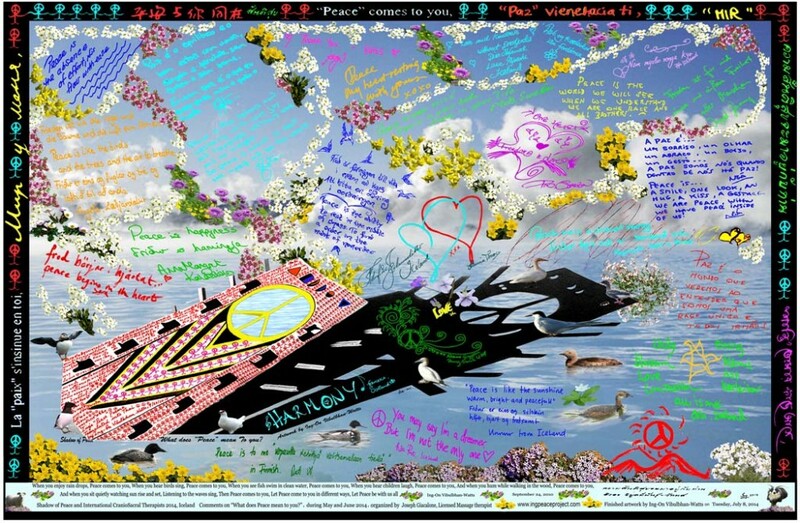 In my dream I ran to every class and every class from kindergarten to high school, teachers talked to students about “What does “Peace” mean to you?” In my dream this was the first day of school and it was the first lesson. I ran all over the school to check in every class. I felt tired but very happy to see the entire school seriously talking about peace. Suddenly I woke up. I tried to continue to sleep but I could not. My mind kept thinking about the dream. I thought how good it would be if it was real and not just a dream. Can you imagine if we cultivate our children to discuss peace from kindergarten through high school? 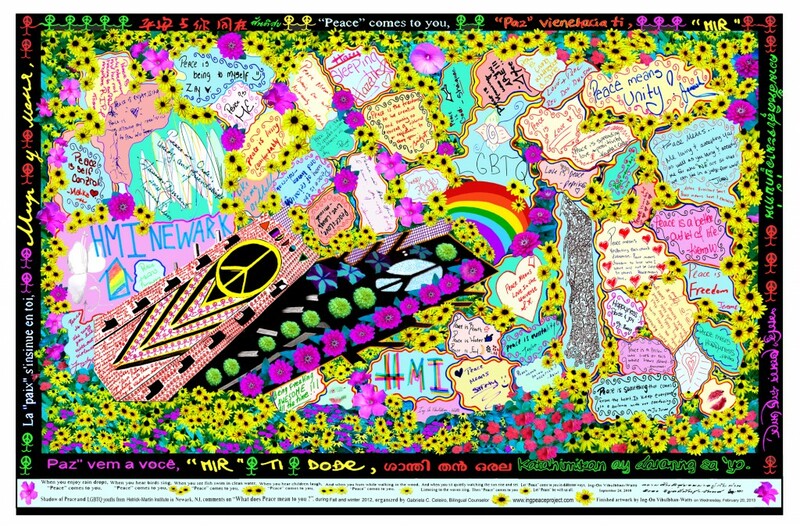 Just once a year the first day of school and the first hour of the class the teachers will take 10 minutes to discuss and ask students to write comments about “What does Peace mean to you?” The students could write a couple sentences or more. Then the teachers will collect the student comments. In the older classes students could write comments in their laptop and sent them via email to the teachers to organize and post on school websites for other students and teachers to read. 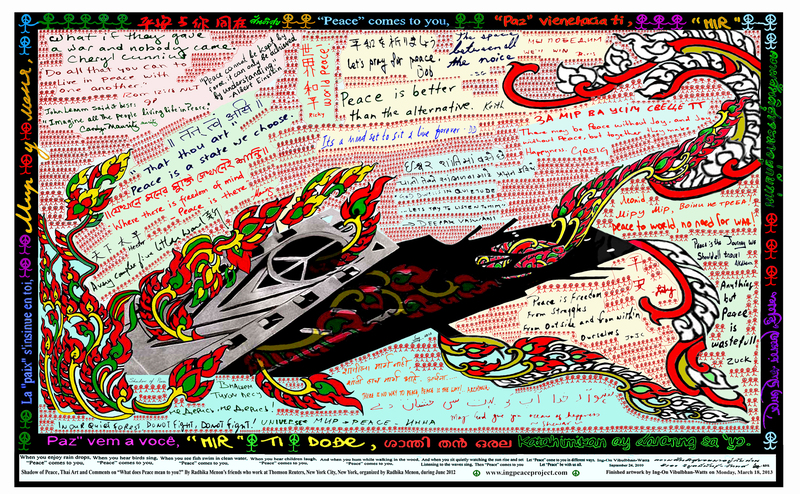 Teachers could also write their comments on Peace. It takes only ten minutes, once each year to organize and execute but hopefully everyone involved would want to know the comments of others and read the school postings. This will generate the conversation among people in school all year round. The students will grow up and their ideas will change, in this way they can observe what the different comments are in the following year. If we cultivate our children for 13 or 14 years to think about Peace, I think we will guide our younger generations into the right direction. So that they can govern themselves more peaceful than the previous generations. But we got to start now to cultivate our children all over the world to concern more about “Peace”. 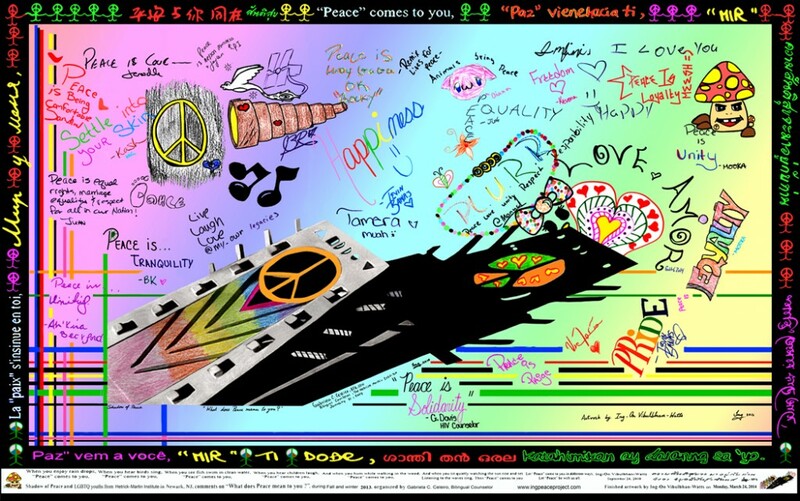 I think this is a great gift to our children from us to our younger generation to be conscious about Peace. This is a better chance for our humankind to be able to live with each other in harmonious as a civilize society on our green planet. 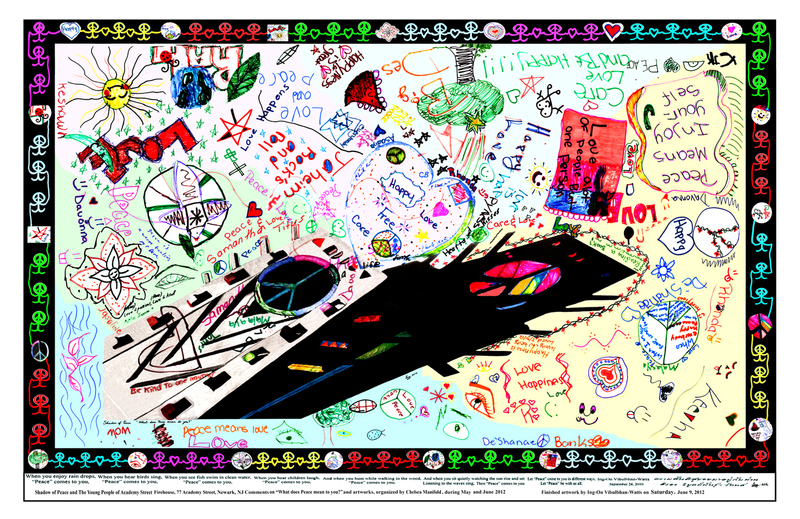 My idea of starting the Peace Project was to spread out the conversation on peace. 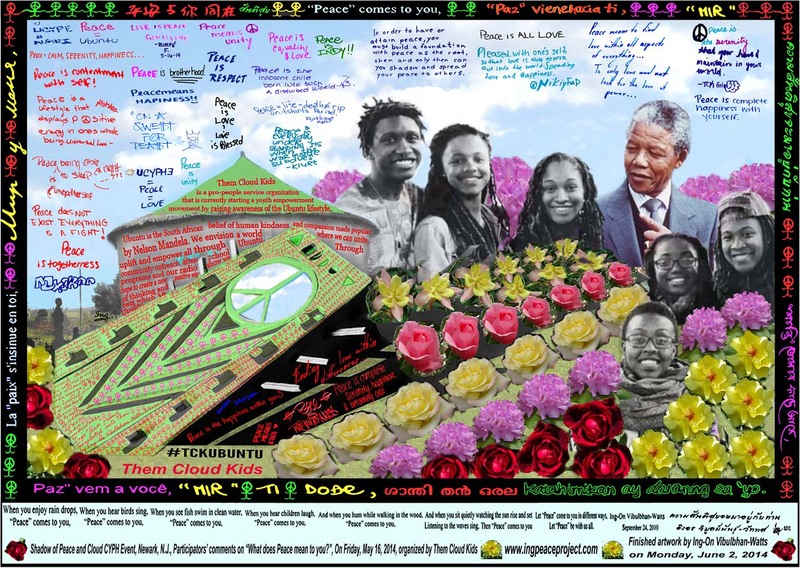 My project is not copyrighted; anybody can use it and set up their own peace project. Peace is for everyone, first for oneself to have peace in order to be happy and function well. Secondly is peace for society. A peaceful society comes from individuals having peace within, as a collective group of peaceful people. Hence we produce a peaceful and concerned society. I am really sad to hear a lot of bad news all over the world, including in this country. Corruption and greed are everywhere, especially with some politicians who are supposed to govern. I see a lot of people fighting about religion, discrimination, race, and sexuality. Lately I started telling people that my peace project is not about religion, not about race or sexuality it is for human being, as long as we eat, poop, sleep and die then we are all the same. We are all equal no matter what religion, race or type of sexuality. There is no donation or any money involved with my peace project, I only want people to express and talk about it. By doing so we are better able to understand each other and try to help each other achieve peace. 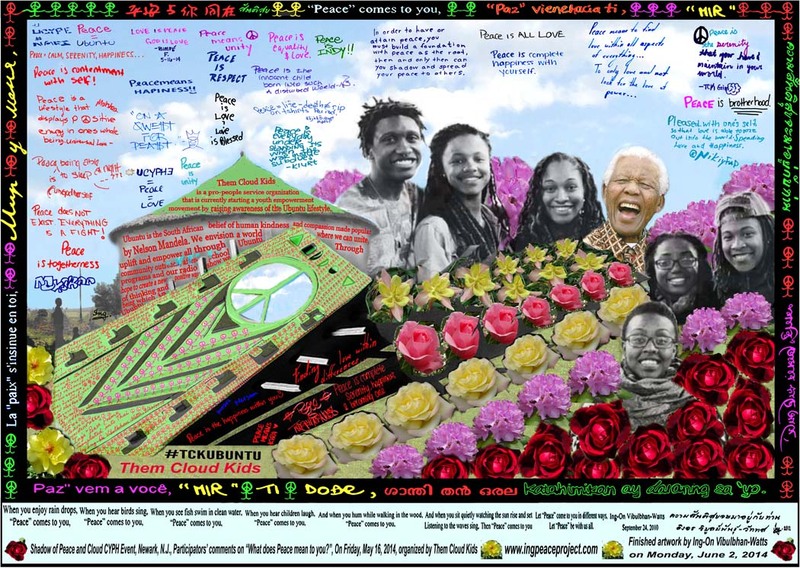 I will be glad to see people use my peace project to develop their own peace projects by themselves. You are young yet. You have energy and ability to do so. 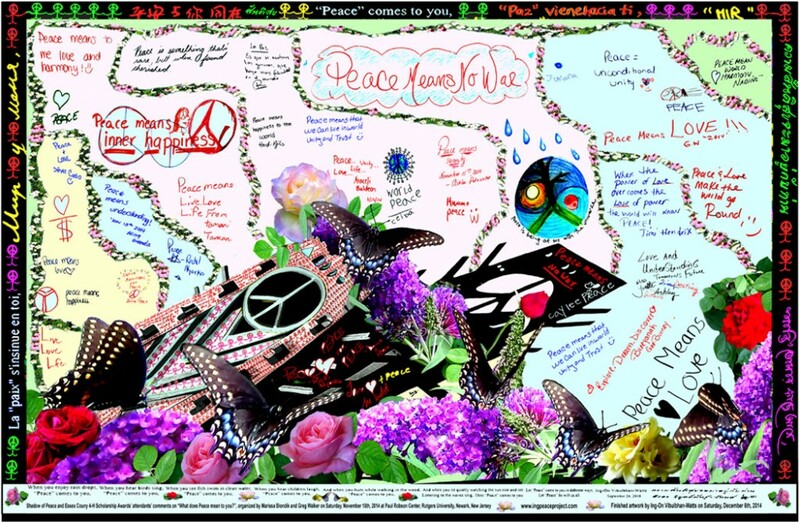 I will help if I can or supply my peace poster and materials. I like to take pictures of others presenting the peace projects as information for what is possible for website. Please let me know if you have any good ideas. 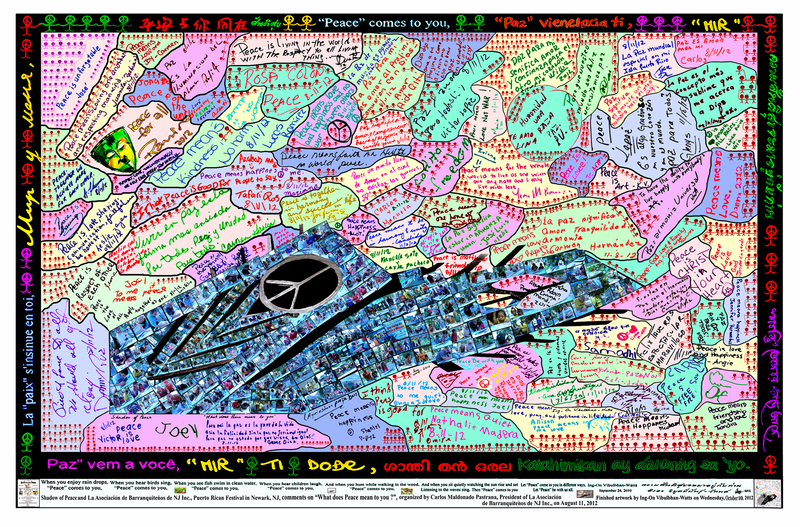 The process evolved into an attempt to have people write in answer to the question, “What does peace mean to you?” This writing is done on multiple two by four foot prints that have the image of my peace sculpture. 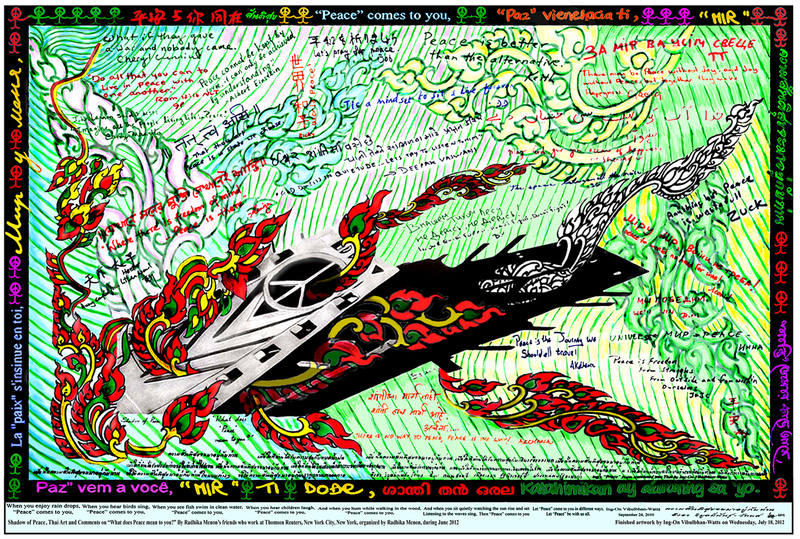 Comments reflect personal interpretations of peace. In the future I intend to have a gallery display of a continuous wall of these prints with these personal messages. I have encouraged those who can do so, to write in different languages. There are messages in many languages. In addition to displaying this project in our shop we have taken the project to a number of settings to have people participate. 10.20.2012 Ing’s Peace Project and The Quarter Mile Print Event at Washington Park, Newark, New Jersey, USA organized by Stephen McKenzie, this project supported by the Newark Arts Council Art Start Program as part of Open Doors Studio Tour 2012. 10-12.2012 LGBTQ youths from Hetrick-Martin Institute in Newark, NJ, comments on “What does Peace mean to you?”, organized by Gabriela C. Celeiro, bilingual counselor. 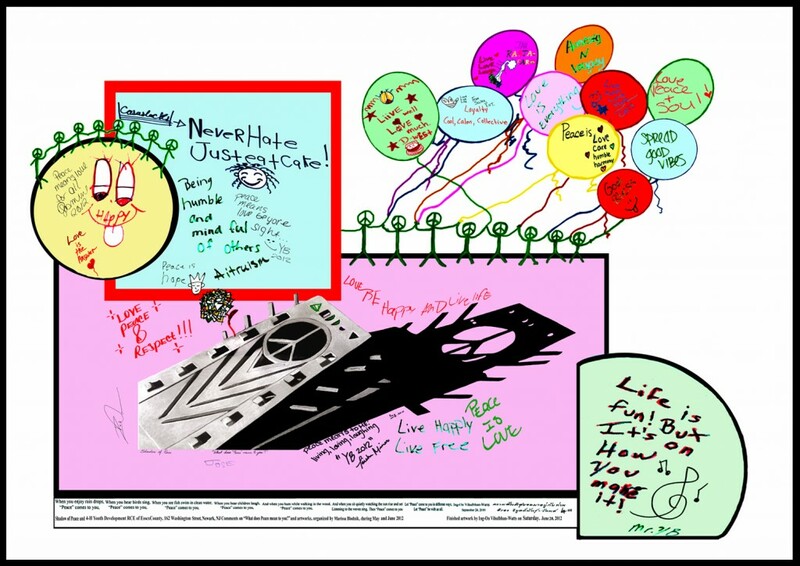 03.02.2013 Ing’s Peace Project and Arts Workshop Program for Adults Open House at Newark Museum, 49 Washington Street, Newark, NJ, organized by Stephen McKenzie, Director of the Art Workshop, second participation. 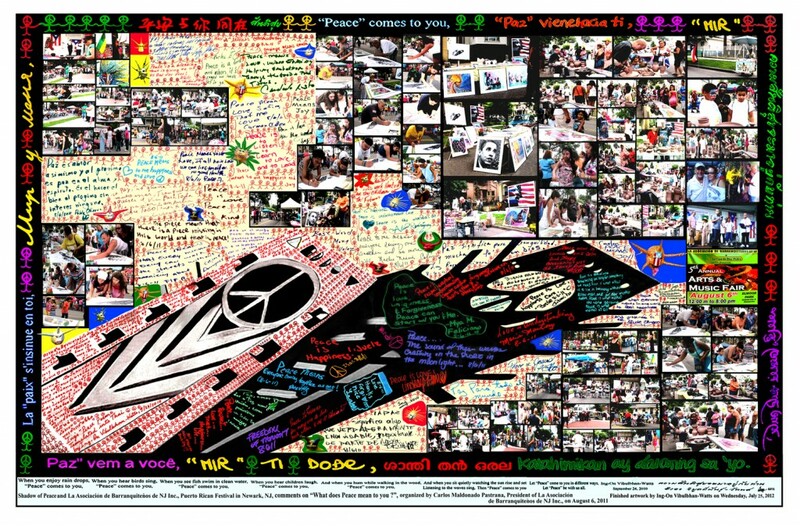 There were more people who took my Peace Posters to introduce friends, family and students about my Peace Project. 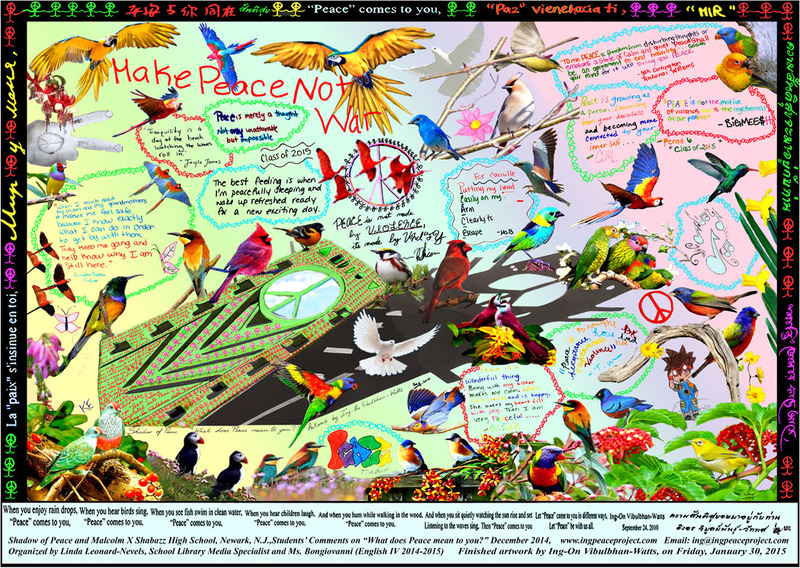 I also presented my Peace Poster for customers and others to comments on “What does “Peace” mean to you?” in our gift shop and art gallery at 57 Halsey Street,Newark,NJ. Since September 2010 up to now I have twenty five of the Peace Posters filled with people comments. 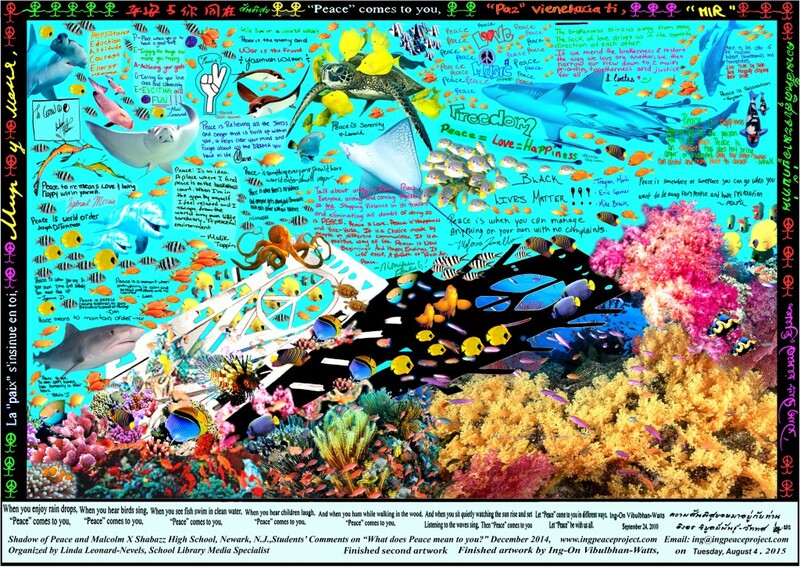 The poster is 24 by 40 inches in size. It took me a while to be able to complete this project. I spent some time to compose this second finished artwork for the Peace Project. The writings were the comments from the people on “What does Peace mean to you?” at the Washington Park and some of the people who participated in the Creation Nation Art and Peace Parade on Sunday, October 23, 2011, Newark, New Jersey, USA. I enjoyed experimenting with different designs. I cannot decide which one to pick for this project. So I decided to put all the seven designs of artwork that I worked on. I will let you, the viewer; select the one that you prefer the most from these seven artworks. Thank you for sharing your flowers with the world and all the mothers out there who may not have such beauty in their backyards. The simple lines and pieces of conversation between a daughter and her mother where very touching to me. Its the little things, the simple acts of love and connection that truly bind us with our mothers. The simple fact that they are mother, mother gives life, love and herself to her children. We are always our mothers child, even after we have our own. Connected to her despite time, distance, or hardships. We celebrate you this day and appreciate you year round! You composed it beautifully. You are a good example of a daughter’s love. The roses are beautiful! Thank you for sharing them. I will show them to mom. I’ll be in touch. I love your website! It’s very inspirational. Please keep up the good work. I’ll send you an email of my thoughts on peace pretty soon. Talk to you soon! Thank you very much for your comment. I am looking forward to reading your email. Please give me your new ideas and help me to improve my Peace Project in order for more people to participate and express their thoughts on Peace. John said to say hello and enjoy your summer. we very much hope that we could arouse your interest with our last reply. We would be very happy to hear from you. Thank you for your interest in my pictures on WTC. I apologize for not replying sooner because I did not open my web mail comments until now. I am very busy at the moment. I will study your website and I hope I will have more free time by the end of the week. Thank you for your comments. I agree with you completely. You are a very wise person who understands that without safety there will be no freedom and without freedom there will be no peace. I like, and agree with you on, “it means to be free to do right things to express yourself in good way”. You are mature enough to know what the right thing is and express yourself in good way. But we are in the world that is still improving and evolving. Some people are clever and mature, maybe due to the family and people around them taking time to cultivate their children. But in some cases of broken families children are left alone to survive by themselves. We may also have some of the people that did not behave in the right way and cause danger for society. I am glad to know your memo (Gwendolyn Caldwell). She is very generous and punctual. She came to see me today as she told. I told her that about 90% of my costumers never come back to pick up the merchandise. I do not care much about selling but I would like to be able to trust people. My philosophy is that trusting is one virtue that no money can buy. I am going to give some of my baby grapefruit plants to your memo. She said you love plants also. I am going to give her few more plants in case you would like to have some. Thanks again for your comments on peace. I hope to see you some day. Please say hello to your memo for me. 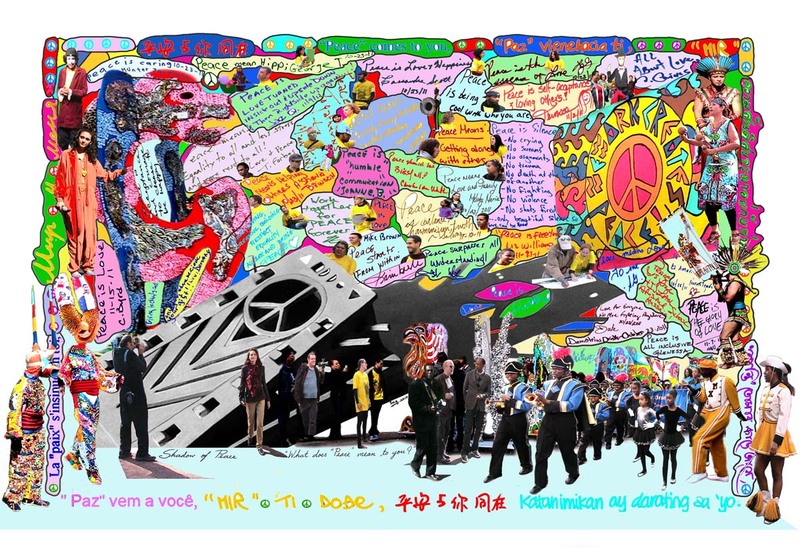 I was looking on line for a poem for my husband to share with his Rotary Club tonight as they are having an evening meeting with the theme of Peace, and found the Portugese version of your poem which then led me onto your site – thank you so much. I had just finished reading the English version and an amazing thing happened: two little birds appeared in my garden that I had never seen before – they got my attention as one flew towards me and tapped its beak at the window while its partner sat on the arm of a garden chair just looking directly at me. The first little bird ( I think they were probably grey wagtails, but I’m not sure) hopped down onto the window cil and tapped at the window again before they both took flight across the lawn to eat some seeds form the bird feeder hanging from branches of a tree just above my Budda statue. It is a cold grey February morning in the UK and the sun is nowhere to be seen, but a moment of peace came to me just then. It was a delight to receive your comments and your story. I enjoyed reading about the birds in your garden and that it gave you peace at that moment. Your writing also gives me happiness and a peaceful moment. I showed your writing to my husband, he smiled and said “It is very nice writing”. I can see that your writing evokes in him thoughts about home in the UK. My husband comes from Swansea, Wales, and anything that relates to his homeland makes him fell good. 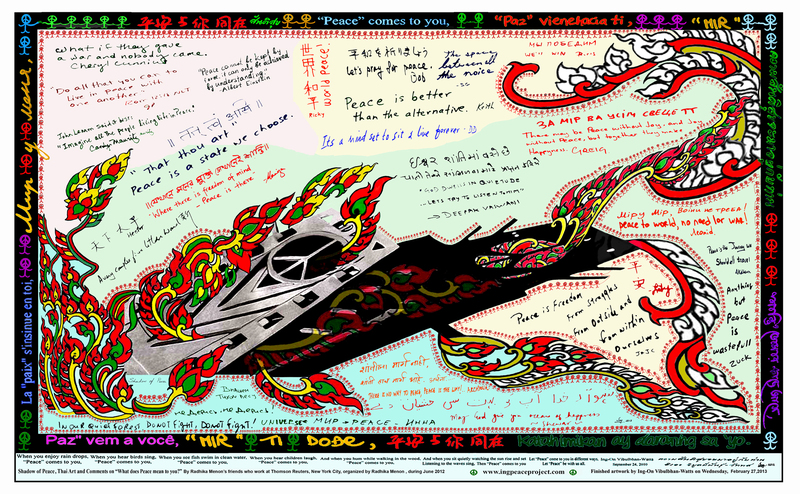 What does peace mean to me. ? 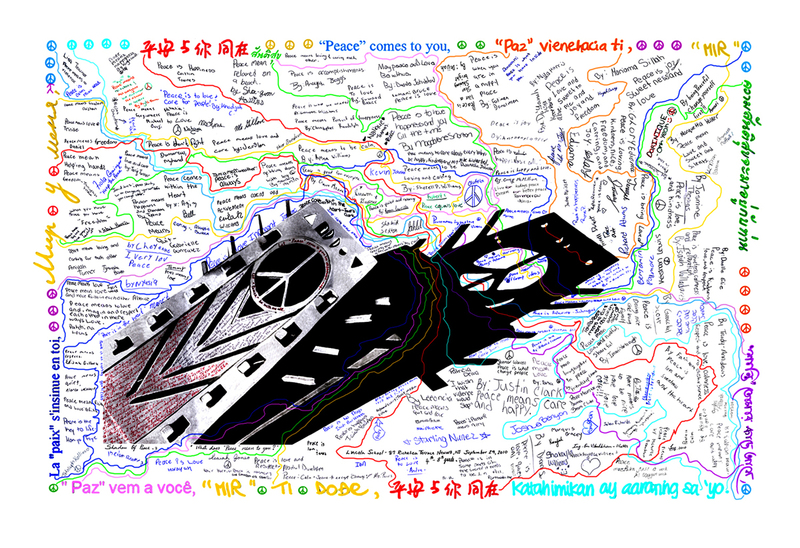 Thank you for your comment on Peace. It is a very good expression and Meaningful. If you have a chance come to our shop again please write your peace comment on my Peace poster. Hi Ing, I would like to stop and speak to you. What time is your shop open on Fridays? Thank you for your email, our shop is open at 12 – 6 pm from Monday – Saturday. I hope to see you sometime tomorrow. 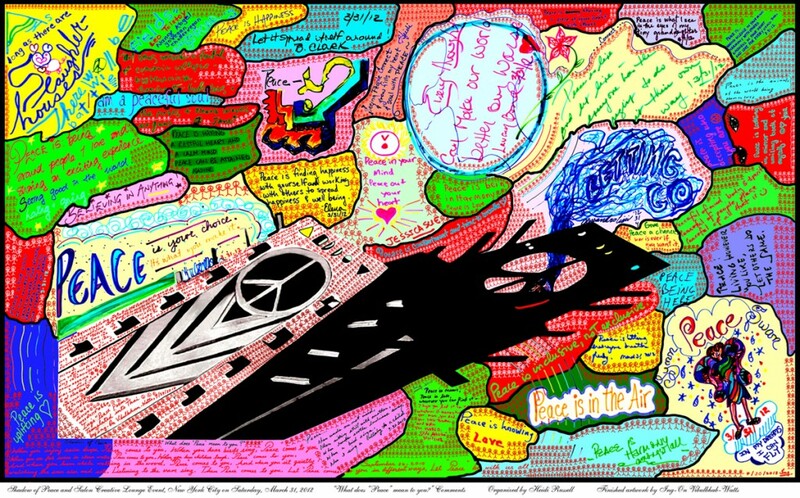 it’s been a privilege to see your art and your philosophy reflected on your Google Plus account. It is my privilege to know you as well. I appreciate all your comments, they were very constructive and a reflection of who you are. I can smile and be happy when I read your comments.